Geologic progression of decay and renewal. 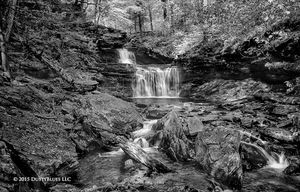 Rickett's Glen State Park. Finally heading downhill on this rigorous hike allowed my spirits a renewed energy. Discovering this new section of falls took some scrambling to attain a composition but watching the cascades energetically pour towards me with the dappling light dancing around in my solitude gave a sense of wonderment and inner stillness.